Once again, geologist Bob Evans is ready to hear the treasure of the SS Central America shipwreck tell its stories. Twenty-six years after he and an unlikely crew of scientists, sailors and shipwreck enthusiasts found the ship’s remains at the bottom of the Atlantic Ocean, Evans is traveling with a new crew to once again uncover the vessel’s secrets. 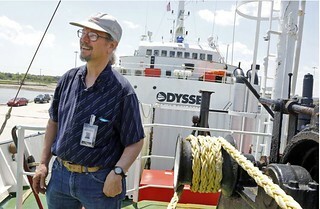 Odyssey Marine Exploration, which owns the Odyssey, has been hired by a court-appointed receiver to bring up the gold, silver and other artifacts that were left behind in 1991, the last time Evans and his fellow deep-sea explorers visited the wreck. Evans was the right-hand man for Tommy Thompson, a Battelle scientist who had dreamed up the recovery effort in the early 1980s and convinced friends and Columbus-area investors that his quest could be successful. Evans and Thompson had been friends since the late 1970s. Thompson relied heavily on Evans’ historical and scientific knowledge as he formulated plans to find the Central America and then, beginning in 1988, to recover its cargo. The massive recovery vehicle they used, remotely operated and cutting-edge at the time, was able to go deep into the ocean where divers couldn’t and pick up the ship’s remains. Once artifacts were brought to the surface, Evans catalogued each one and cleaned and preserved them. That included several tons of gold and silver, which eventually sold for more than $40 million. Now, more than two decades later, Evans is the only original crew member returning to the shipwreck. “I’m excited to apply the new technology on the site,” he said last week as he showed visitors the “coin room” on the Odyssey, where he’ll once again catalogue, store and keep track of the gold they expect to bring up. While the basics of the robot are the same — lights, mechanical hands and cameras that beam photographs to the ship above — the sophistication level has been dramatically improved with digital photography, modern computers and crew members expert in maneuvering the robot and viewing the shipwreck. Remembering the earlier expeditions to the shipwreck is like seeing yourself as a character in literature, said Evans. Since the find, he became an expert on the recovered gold coins and has given speeches across the country about the treasure and the expeditions. Most of his time is spent on his small farm in Muskingum County, but he’ll remain on the Odyssey this summer.